This is my 1st time baking an actual-sized cake! Since I've done cupcakes numerous times, I thought it'll be good to try out my hands on an actual-sized cake for Gloria's popo's birthday. I've been staying in the same house with her since the beginning of last year. It would be lovely if I can actually bake her a cake for her birthday! I'm EXTREMELY pleased! The cake was a winner! 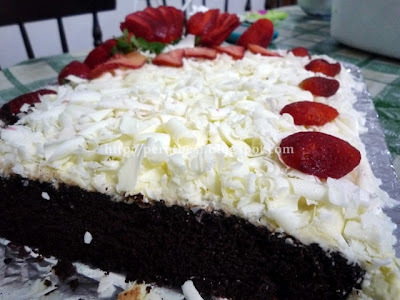 Moist chocolate cake that's not so sweet, topped with sweet white chocolate shavings & sweet-sourish fresh strawberries - awesomeness! 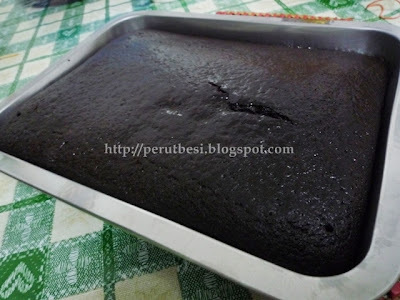 Combination of soft + moist + crunchy + sweet + sourish = PerutBesi's 1st proper cake! The successful moist chocolate cake - YUMS! 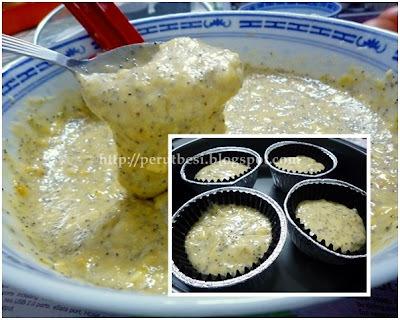 I was quite worried when the batter looked more "watery"/liquid-ish than my usual cupcake ones, but I just went ahead to bake the cake anyhow. It turned out superb in texture & taste! Pretty much just the way I wanted! Hurray! I wasn't too hopeful but had that glimmer of hope that it'll turn out alright - and it did! Thank You, God! 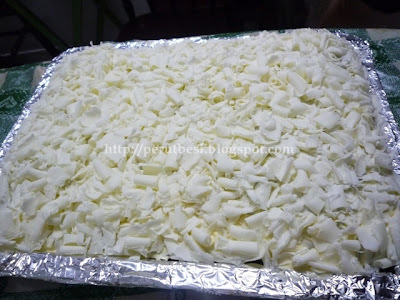 So for the icing & topping, white chocolate shavings came to mind since I had a block of white chocolate. I had to have some "cream" to get the white chocolate shavings to stick, so I did up a simple buttercream just to be the "sticking agent" for the white chocolate. I actually used the "fruit peeler" to shave my white chocolate :D I'm gonna finish the cake's deco with strawberries right before serving to preserve freshness of the fruit :D I'm PLEASED! 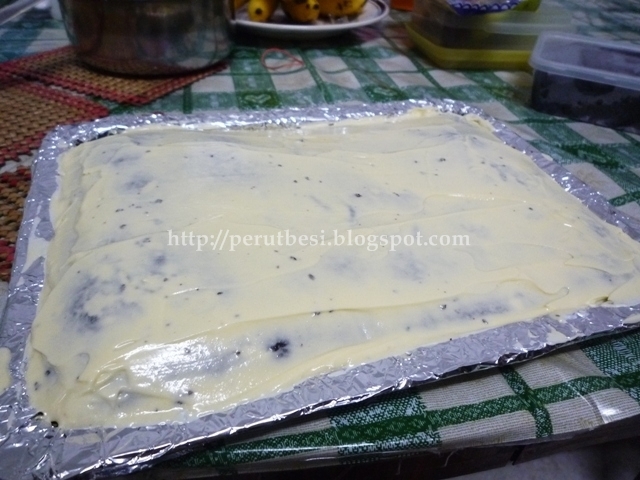 Hand-whipped some buttercream as "sticking agent"
I think the cake will look quite pretty once I add the strawberries! Red, white & chocolate-brown...ah, lovely!! 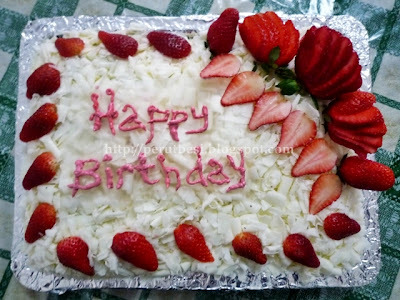 My initial plan was to have the cake looking just like those from the shops where there's cream in between (I've to cut the cake into half & put it back together). 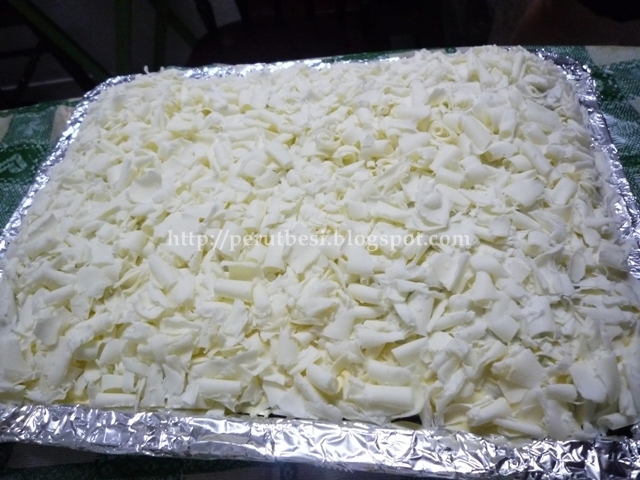 I also wanted to coat the sides of the cake with cream & cover it with toasted nuts at the bottom & the white chocolate shavings at the upper end of the sides. I couldn't get my "vision" accomplished this time :( I didn't have proper tools & utensils to get it done. No cake box. No cake tray to place the cake just like in cake shops. I just didn't plan to bake actually, thus I didn't buy. Hope you enjoyed this post! Stay tuned with PerutBesi! I've been baking mostly chocolate items since I picked up baking, so I decided to give it a change to bake a non-chocolate item instead (I had some time after work last night, so the muffins now are half-a-day-old). 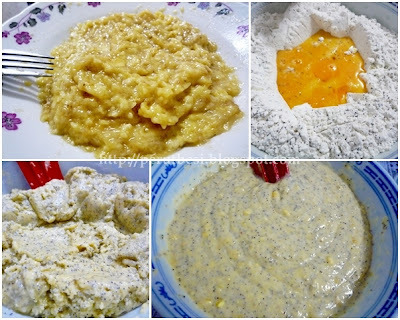 I actually bought the banana muffin pre-mix from Bake with Yen & all I needed was some fresh bananas, oil, & eggs. 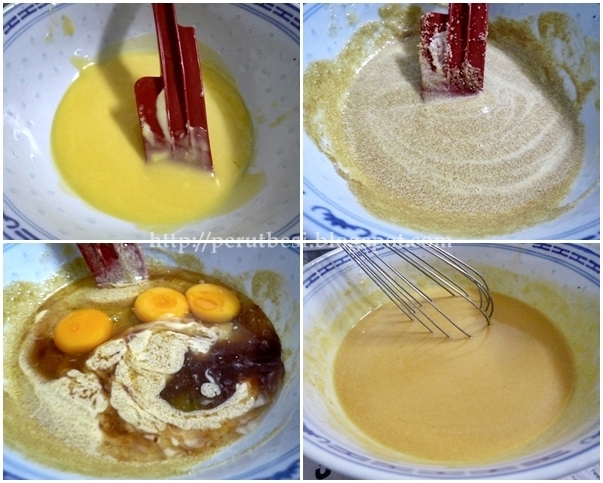 I added some vanilla essence & water too as the mix felt REALLY thick. Walla! Banana muffins - fresh from the oven! A 'lil crusty on the outside, moist on the inside. It's not too sweet, but I somehow feel that this pre-mix has "kan sui" (alkaline water), which I didn't really fancy. 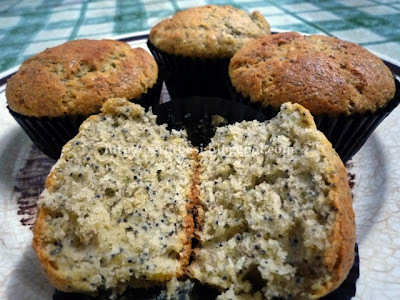 But overall, it's a pretty good muffin. Best accompanied by a hot cup of tea, I reckon. Coffee & milk would do too! 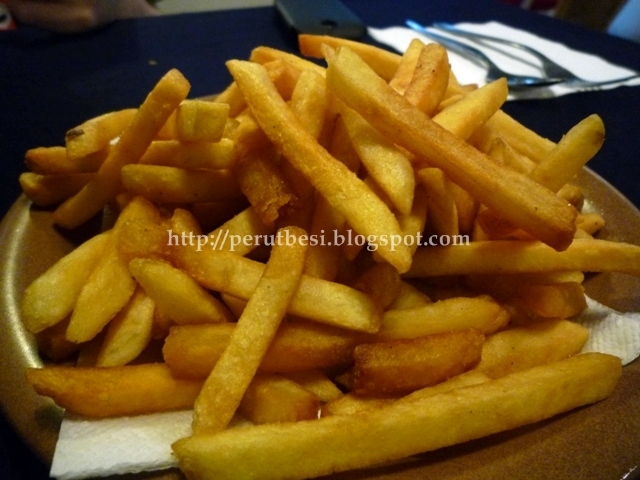 Overall comment: Decent YTF, but it's kinda costly since each piece of YTF is RM1.10! 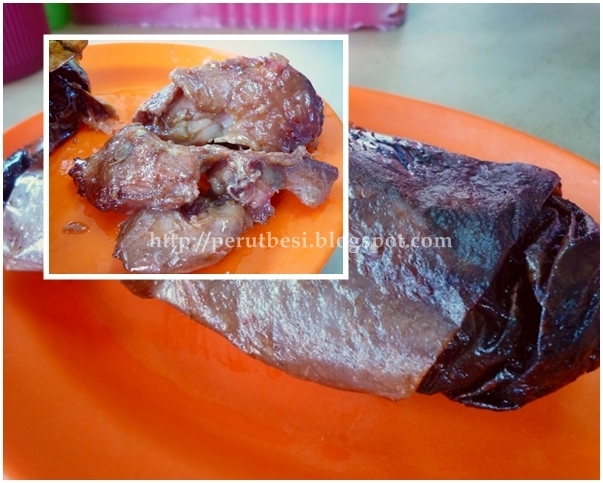 The "paper wrapped chicken" was the most not-worth-eating item on the menu. I wish I noticed the price list earlier before I ordered *sigh* I just thought of trying, but it was quite disappointing. I very much prefer the ones in Serdang/SK...oh, I miss my old workplace & colleagues as well! I've never been to this part of the world, I reckon (I've been to Jalan Ipoh itself! Does that count?). KL & I aren't the best of friends & we haven't been "keeping in touch" for quite some time. The only reason I would go to KL is to take a bus to Kuantan or to pick my bf up from the bus terminal if he takes a bus from Kuantan to KL. Hahaha. Yes, I can name you the few roads in KL that's on my "Ruth knows" list. Since I'm such a jakun for a city girl that I supposedly am, my colleagues decided to head to Segambut's YTF for lunch (it's like some educational lunch tour for me). They said it's not too far from office, which sounded quite peculiar to me 'cos all along, KL seems like a faraway & often jammed place. If it was at least tasty, I won't feel such immense regret for ordering this...I could cook a better "paper baked chicken" k? 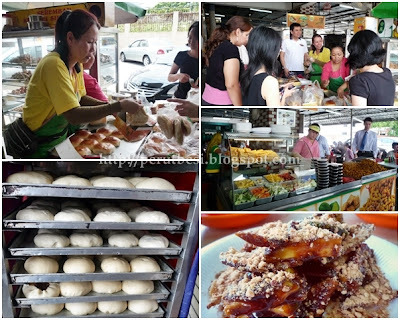 The "chan bao" here is not too bad (baked buns with char siew). It's comparable with the one I used to like in Taman Mayang Jaya, although I feel that the standard has dropped & the price has also increased. The rojak here is also acceptable.I wish the rojak sauce was more fragrant though...it still lacks "umph". My Baking Diary - I'm so bored, I made brownies! Yup, I bake cos I'm bored (just for tonight, ya)...it's not that I have nothing else better to do, but I thought it would be nicer to take a break from the laptop screen & try out something "new" instead :) It's too hot to just sit in the room & stare at the laptop screen anyway. 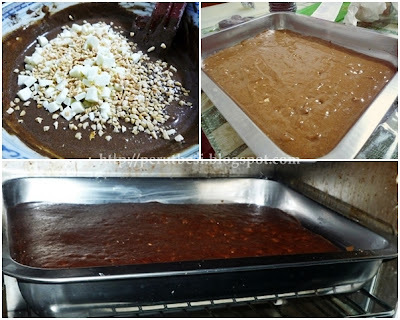 While typing this post, my brownies are still in the oven. Ah, I love brownies...since the recipe looked simple enough for a newbie like me to follow, I decided to take up the simple challenge & keep myself entertained. 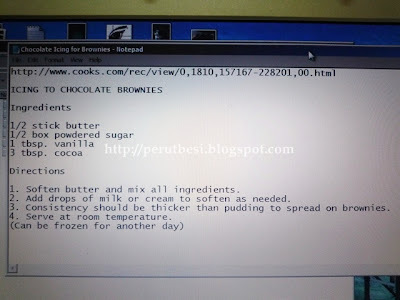 I used the recipe from this site & it bakes the "Mrs. Quinn's Easy Brownies"! 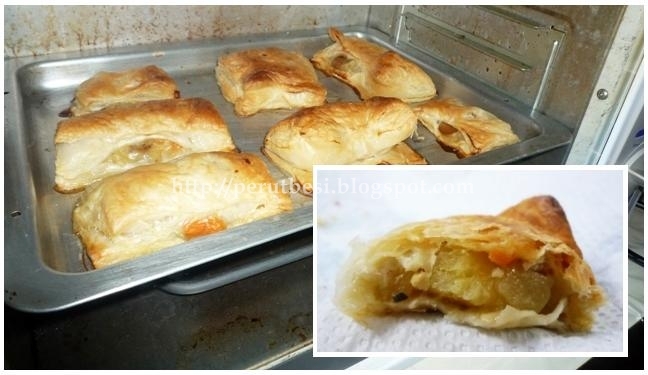 The word "easy" was one of the words that tempted me to use this recipe from the many that I found online. 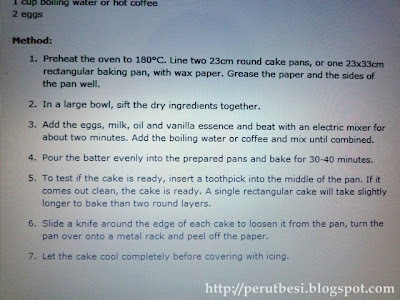 The other word in this recipe that caught my attention were the words "rich fudgy kind". Om-nom! 1. Heat oven to 350 degrees, grease a 13x9" pan. 2. 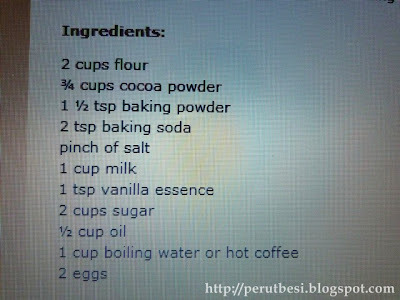 Beat butter, eggs, sugar, vanilla in a large bowl. 3. 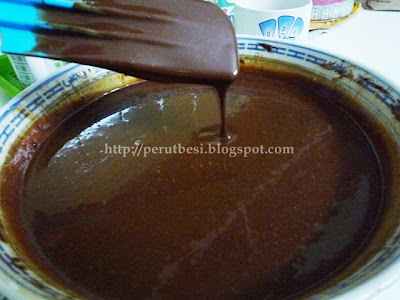 Mix in cocoa, flour, baking powder and salt. 5. Stir in nuts and chips. 7. 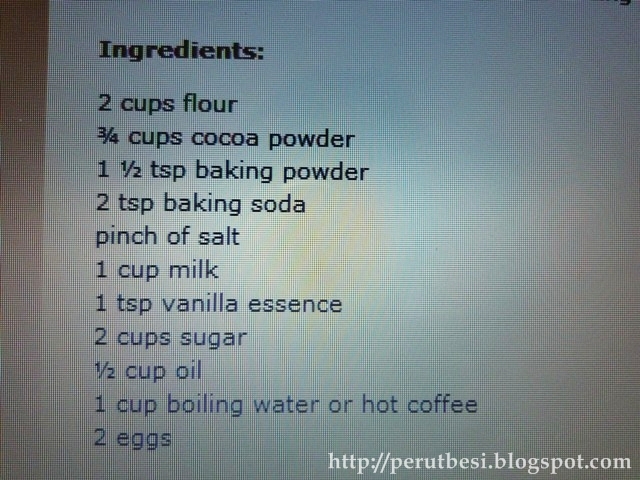 Bake Mrs. Quinn's Easy Brownies for 20-22 minutes. I've no idea who is Mrs. Quinn & am not associated with her, but the recipe works! As I don't have a cake mixer, everything is hand-mixed! 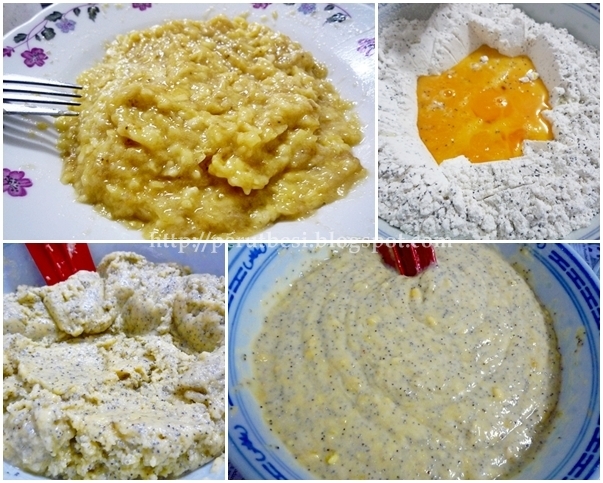 Clockwise from top left: Melted butter, melted butter with added brown sugar (I used brown sugar instead of castor sugar), whisk the butter + sugar & you'll get a smooth mixture, added in the eggs + vanilla essence. Clockwise from top left: Add in chopped, pan-toasted nuts (I used the chopped almonds that I have in my supply), stir in the nuts + choc & pour into the baking tray, brownie baking in the oven. Yes, I'm mad...and I like it...this IS GOOD! Just what I needed it to be - sides shrink away from the pan. AWESOME!! Time to cut the brownies & store it up for tomorrow :D Woohoo! 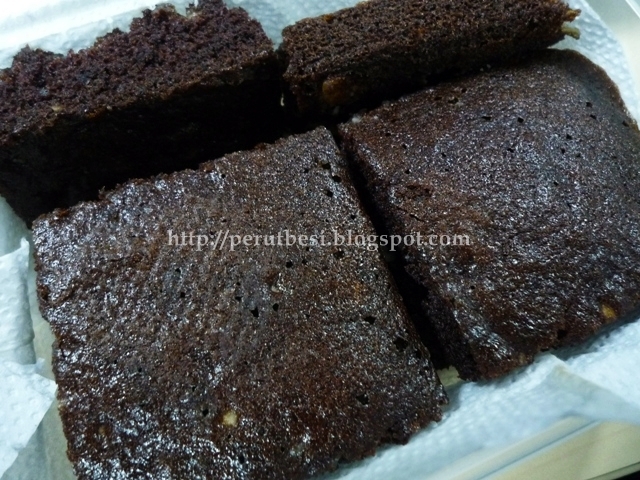 There'll be home-baked brownies & chicken puffs (yes, I made these too) for breakfast & tea tomorrow! 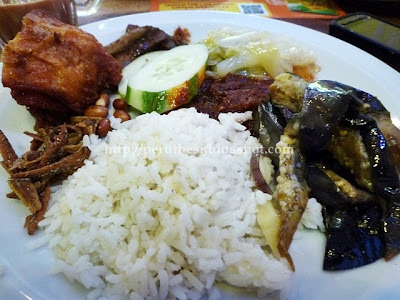 I had it for breakfast...yummilicious! 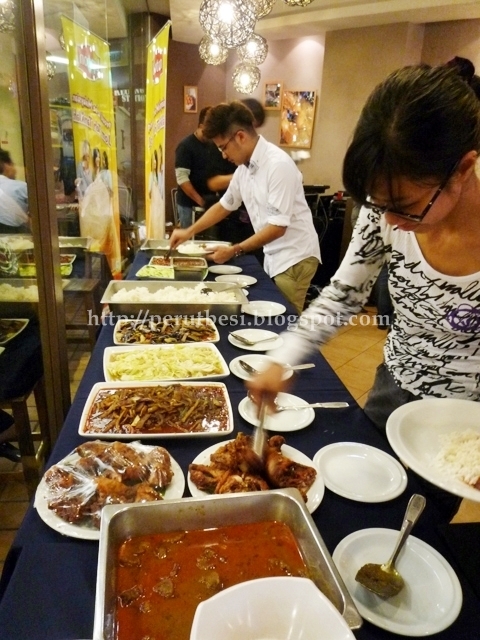 Overall comment: As mentioned by most patrons of Dave's Bistro, the food here is worthy of praise & recommendation. I felt that it's a little pricey though, but since I bought the 50% off coupon deal from Hahah.com.my, I thought it was not too bad for the overall bill. Dave's has been around for as long as I could remember. 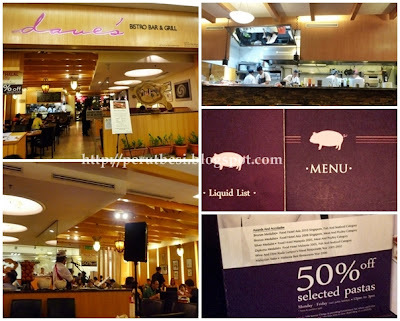 But surprise, surprise, I have never walked into this restaurant since it started! Hahaha....yeah, for one, I rarely go to 1 Utama unless I really needed to (and I wouldn't be bothered going to a shopping mall unless I have to). This restaurant was previously called Dave's Pizza Pasta Vino before it was renovated & walla! its name changed as well! We were there on Saturday, so the live band was playing not-too-bad music. It was a 'lil too loud, but still bearable for me. My friends felt uncomfy though...hahaha...If you come over on weekdays, you could actually get 50% off selected pastas - that's quite a deal considering their pastas are on the higher end of prices (RM23.00 - RM45.00/serving). The pizza on the other hand was not too bad. Compared to the wood-fire pizza I had at Desa Sri Hartamas' Pizza Brava (I've yet to blog - soon, soon), which could fetch at least 75%, this one just fares around 50%? 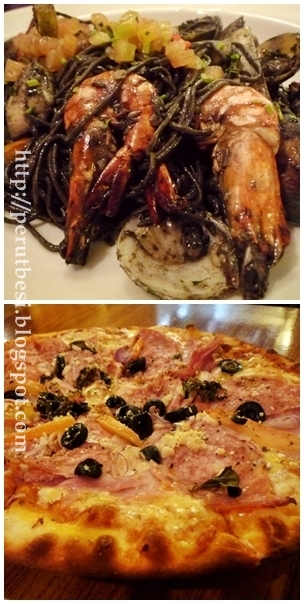 There's nothing much to complain in terms of taste, but texture & "umph" somehow is WAY better at Pizza Brava (in my personal opinion). The dough/pastry is thinner at Pizza Brava. It's not as filling at the one at Dave's but somehow it tastes nicer overall. Business hours: Daily 12:00p.m. - 11:00p.m. 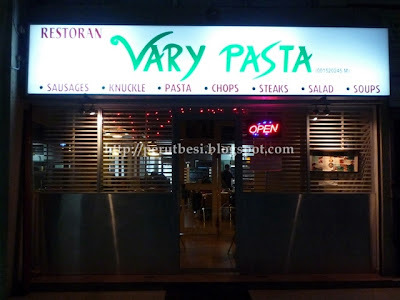 Overall comment: Pretty tasty pasta dishes at affordable prices. This is a LONG-overdue post, but I'm just gonna make it a point to blog about it cos it's worth mentioning! My little "innovative projects" aside, to sum it up, Vary Pasta offers decent pasta & chops at very affordable prices. 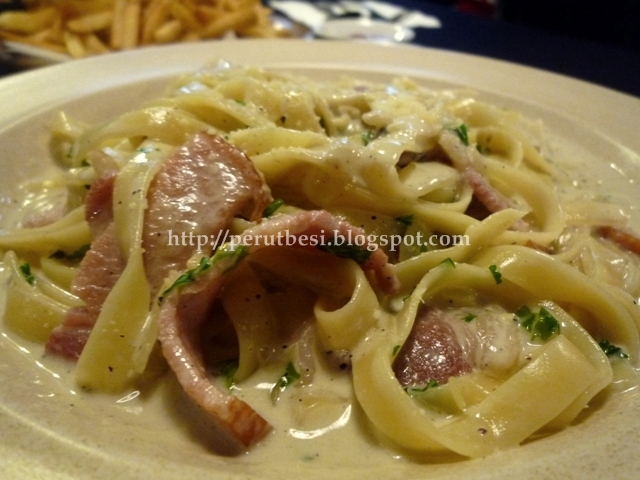 For RM11 - RM20, you can get generous portions of pasta & chops! Creamy pasta (linguine) with just-nice pan-fried pork bacon - not fried 'til dry/crispy so that you'll still get to chew on the meat (gives the pasta some "meaty" texture). Fresh chopped parsley tops the humble pasta dish. If you don't want something too creamy/"jelak", this is actually a good option. 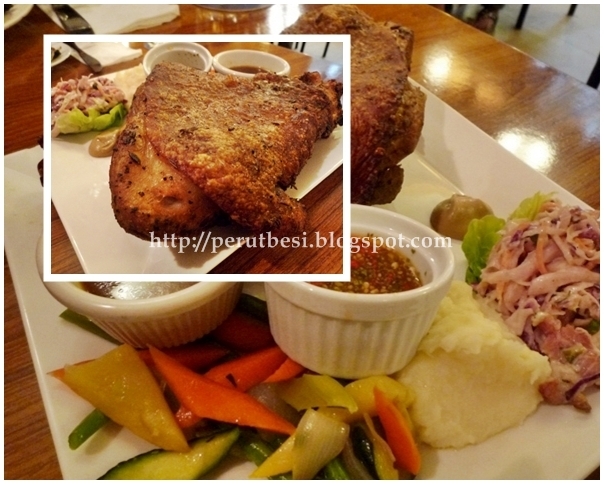 You can opt for chicken/beef as well. 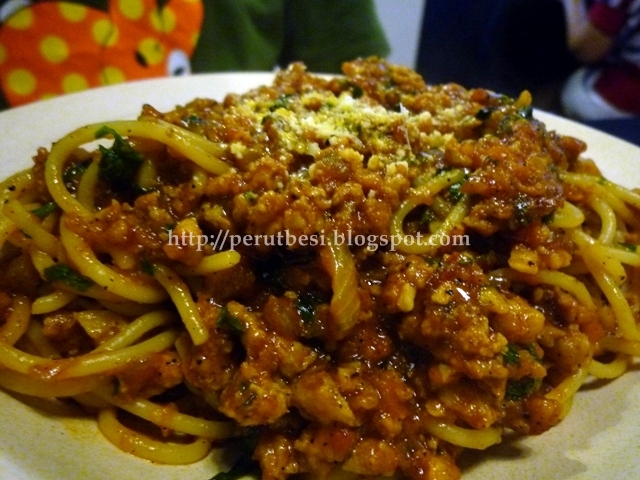 I find the bolognese quite pleasing to the palate & hey, it's affordable for the portion & taste served! You can totally see that it didn't go through any interior designer! It's like a mix & match restaurant - whatever goes! 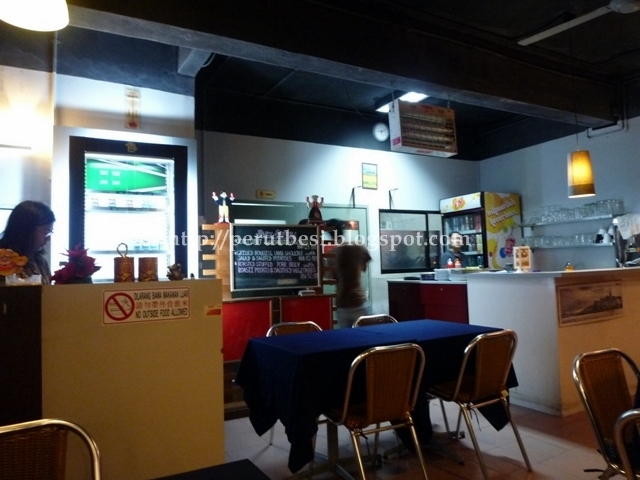 Looks cafe-ish & coffeeshop-ish at the same time. Nevertheless, aircon is fine, tables & chairs are comfy - pass! Pocket-friendly chops, pastas & more! 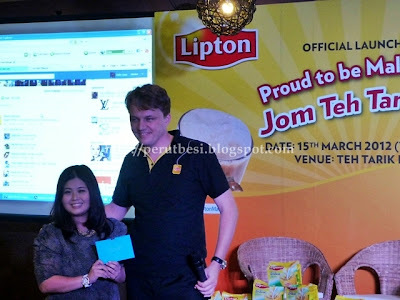 Lipton Malaysia launched its "Proud to be Malaysian. Jom teh tariklah" campaign for bloggers with emcee, Melvin Aeria, doing an excellent job to build up the excitement of all invited bloggers & the Unilever (M)/Lipton team to celebrate the launch in a mamak-style setting. It's such a great pleasure to be there for the launch & I would really want to thank Kiersten Chaik from Edelman PR for extending the invitation to me. 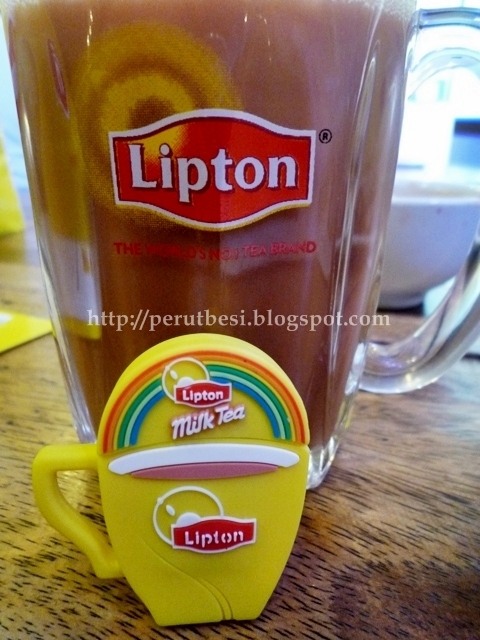 Check out the small 'lil cuppa tea...heehee....it's part of the goody bag - a pendrive! SO CUTE! Marketing Director, Malaysia & Singapore, Unilever (M), Hugo Verkuil gave an interesting speech, sharing with us how his team were inspired by the all-Malaysian teh tarik that they decided to come up with Lipton's own version of the instant teh tarik. 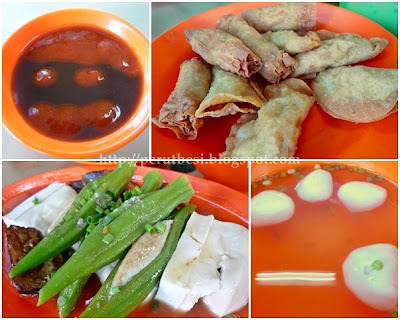 Going from mamak to mamak (for almost 2 years! 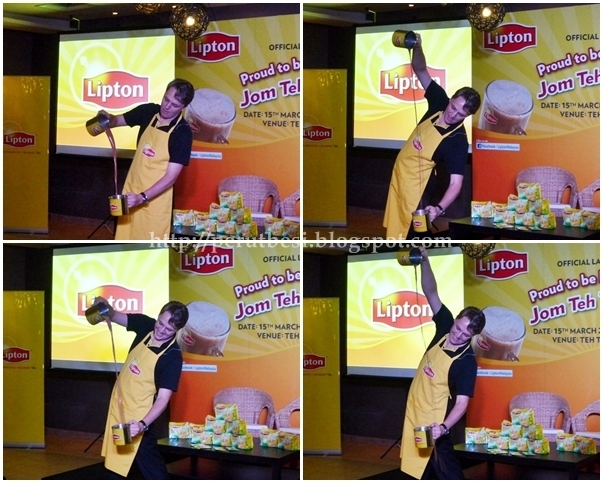 ), drinking all sorts of teh tarik you can ever get in Malaysia, the team took 2 years to research & come up with an extremely fragrant, smooth, silky, & thick instant teh tarik! I'm so impressed - seriously. 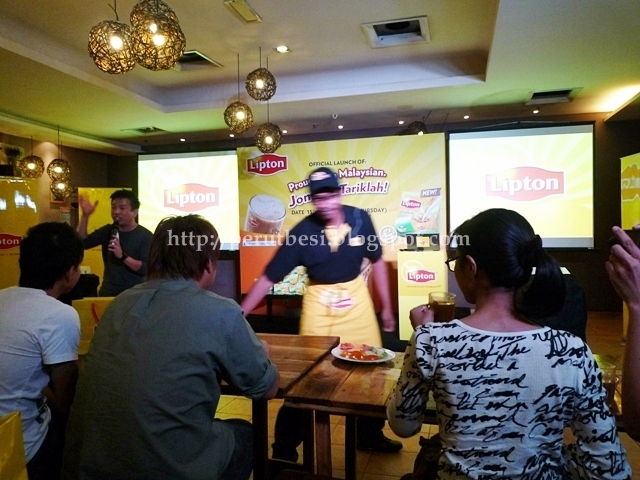 After the speech & games, all bloggers' attention were brought to the projection to view the premier of Lipton Malaysia's 1st webisode of its teh tarik product. 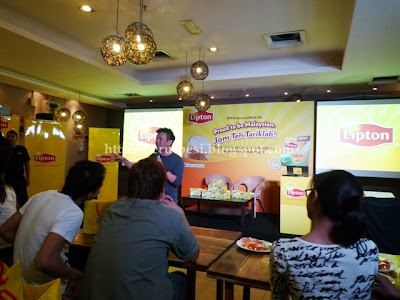 It was pretty interesting :) All 6 webisodes will be posted every Monday on Lipton Malaysia's Facebook fan page, showcasing familiar characteristics of all Malaysians! Watch out for the 1st webisode in 2 days time!! You can also get the video here on their Facebook fan page. 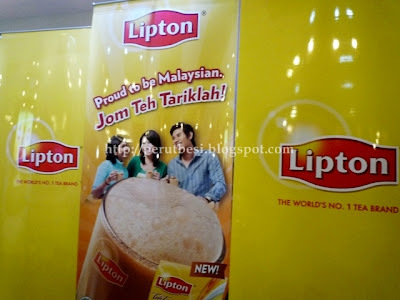 It was an enjoyable time at the launch & I'll recommend you to try out for yourselves the Lipton's Teh Tarik - instant yet with such mamak-ish "umph"! Try out Lipton's Teh Tarik! You'll get to purchase it from major supermarkets across Malaysia for RM13.50/packet of 12 sachets. 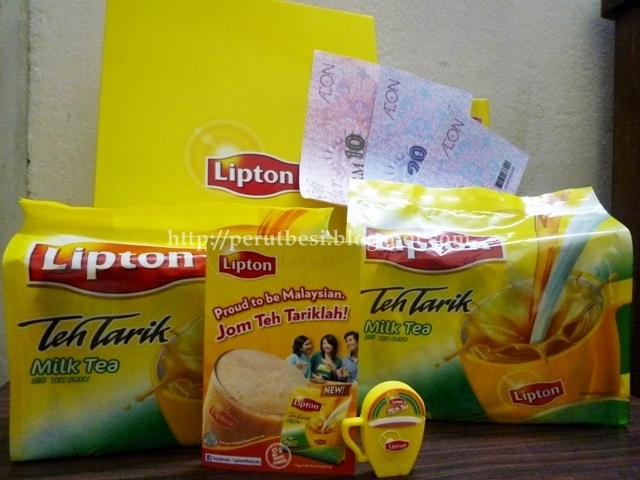 My goody bag + 1 extra packet of Lipton that I "won"
Stay tuned for more from Lipton Malaysia on their Facebook fan page! 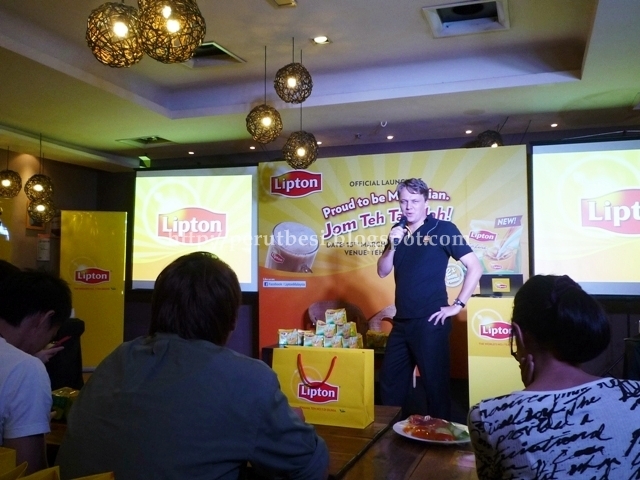 There'll be exciting contest(s) with great prizes to be won as well! My Baking Diary - Cupcakes & FONDANT!